Coach Danny O'Donoghue decided not to take the singing hopeful to the live shows, after viewers watched him tell Vince to tone down his vocals. Vince, who performs barefoot, told the Gloucestershire Echo: "I am livid about it. "I was put in a difficult situation - I could go against my mentor, knowing that I would not go through, or I could do as I was told knowing I was having my hands tied behind my back. "I don't have a problem with Bo but I'm not happy about how the situation was manoeuvred." 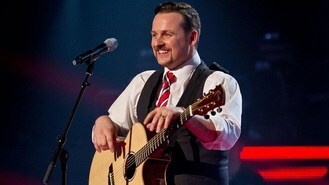 Despite failing to make it, the singer said that he has no regrets about taking part in the show. "For me, The Voice has been a fantastic experience for getting my name out there," he added. His comments come after another of the show's rejects J Marie Cooper blasted the programme, claiming she was kicked off because of her age. "The fact that I am 27 should not have even been a factor. It's called 'The Voice' not 'The Age'. I'm stating facts here," she said.